Many manufacturers have come up with smart and inexpensive paper shredding machines capable of quickly eliminating sensitive data on paper and CD/DVD discs. 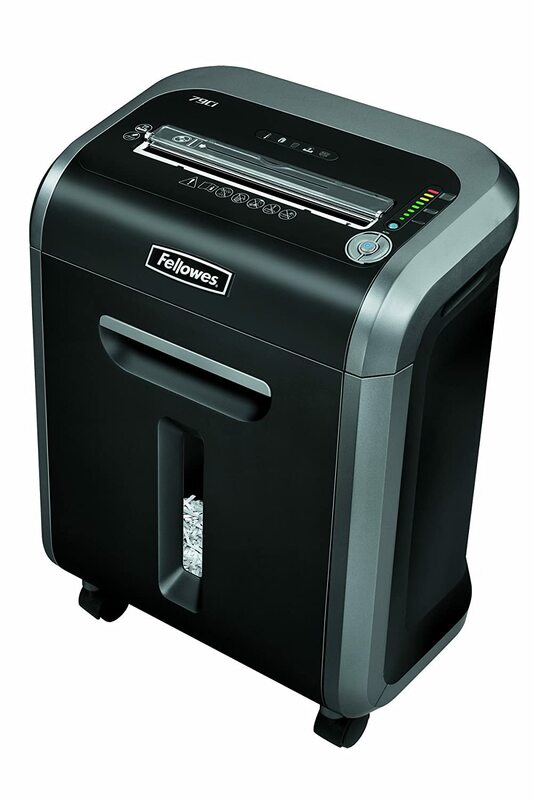 This is one of our Fellowes paper shredder reviews. This time we selected the popular Fellowes Powershred 79Ci Cross-Cut 16 sheet shredder. This revolutionary paper shredder has been designed with exclusive features that ensure no paper trails are left behind at home or in the office. This machine comes with the safety technologies that allow it to operate at home in the presence of kids and pets without causing any injuries or accidents. The Fellowes Powershred 79Ci Cross-Cut paper shredder is designed to cut 16 sheets of paper at a time. Apart from cutting plain paper sheets, this machine is able to shred CD/DVD media, paper clips, staples and credit cards. To ensure that the cutting process runs smoothly, this shredder has been designed with a 100% jam proof system which prevents any paper jam during the operation. For increased safety, the Fellowes Powershred 79Ci comes with a SafeSense technology that activates the safety sensor around the machine. This technology automatically switches off the shredder when a hand is detected during operation. The Energy Saving technology, the Silent Shred technology, a run time of 20 minutes and a cool period of 30 minutes are some additional features that make the Powershred 79Ci ideal for both home and office use. Last but not least, this shredder comes with a 6 gallon pull out bin, a 2-year product and service warranty as well as a life time cutter warranty. If you like these features but need a slightly more powerful machine, then check our review of a similar Fellowes Powershred 99Ci model. 100% jam proof — paper jam is one of the most frustrating setbacks with most shredders. To solve this problem, Fellowes shredders are designed with an advanced paper jam prevention technology which eliminates any type of paper jam during operation. This machine uses three levels of operation to eliminate paper jam. In level one, a special sensor measures the paper thickness being inserted. Level two activates tough operation to ensure that all papers are cut while level three features a light bar that informs you on the maximum number of papers to be inserted. SafeSense technology — the SafeSense technology is an important feature avoiding injuries during machine operation. An electronic sensor automatically shuts off the shredder when hands get close to the paper entry. It makes this product one of the best home cross-cut shredders especially if you have kids or pets. An ultra silent operation — unlike the traditional noisy shredders, the Fellowes Powershred 79Ci Cross-Cut Shredder comes with a SilentShred technology that decreases noise level during operation. This way you can use the machine without bothering your colleagues in an office or sleeping kids at home. Superior performance — the Fellowes Powershred 79Ci is designed with powerful stainless steel cutters and a strong motor able to handle CD/DVD discs and credit cards. SafeSense technology that turns off the shredder when your child or pet comes closer to the blades. This shredder is designed with a simple style that makes it easy to clean and maintain. Many customers are very happy with the silent operation of this machine (low frequency motor that is quiet when operating). Patented 100% jam proof system. To conclude this review, the Fellowes Powershred 79Ci is not the cheapest shredder in the market, but for its price you will get a great quality cross-cut machine with a very smooth and reliable operation. Designed with a mix of safety and all purpose technologies, this shredder can be used in small offices or at home without compromising on performance. It has a powerful motor, numerous technologies and an energy saving feature which lets you minimize the amount of power being consumed. The Fellowes Powershred 79Ci has been welcomed with a superb 4.7/5 star rating from over 2,500 verified Amazon customers.